Here you get classic first editions for cheap. Delhi is a city of surprises. Who could believe that great bibliophilic booty is lying right in the heart of Lajpat Nagar Central Market, of all places? This Alibaba’s cave, innocuously called Anjali Book World, is unknown to many. Its patrons, some from as far as Chandigarh, are so protective about it that they wish it to remain a secret forever. “If too many people know about this place, the wonderful books here will be sold out sooner and I’ll be the loser,” said a customer who comes here all the way from Dwarka. More than 50,000 books are spread across more than 2,000 square feet — on the shelves, ceilings, and floor (sorry, no shelves on the roof) — and more than double that is claimed to be gathering dust in warehouses. 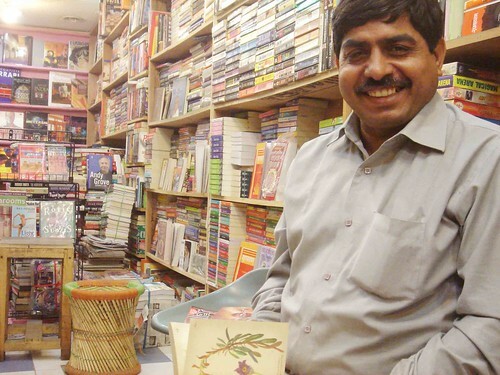 “I have rare, out-of-print books,” says owner Mr Ramesh Madaan. A passion for books led him to fold his clothes trade in 1996 and open this bookshop. He named it after his daughter. In the beginning, Mr Madaan’s book-loving friends assisted him in building the stock. But it was his networking with collectors, importers and distributors, in addition to explorations in the Sunday Daryaganj Book Bazaar, which really sexed up the store. The collection is maddening. From Julia Child’s recipes to Mozart’s letters, from Princess Diana’s extra-marital flings to Monika Lewinski’s scandal. A lucky day could get you the first edition of a William Styron or a Salman Rushdie. Hindi is not ignored. I got my copy of Arundhati Roy’s Mamooli Cheezon ka Devta (aka The God of Small Things) from here. Rs 100, after bargaining, of course. That copy is in my library now! Mills & Boon lovers needn’t be disappointed. The bookshop owner is no snob. Jane Austen lies next to Danielle Steele and your regular M&Bs. “We all have different tastes,” Mr Madaan says. Quiet, we’re reading. Hey! Why is this version different from that in HT City??????? The only problem with the place is the prices are not fixed and the gentleman owner is quick and canny enough to change the price within minutes. There is still Daryaganj one could consider, there used to be Shrijee in South Ex, I wonder if it’s still there. One lace Delhiwallahs shld really miss is 20th Century Books in CP. It had an astounding collection and the owner was a real gentleman: he’d fix prices all written on the books starting with Rs.50, Rs.98, and Rs.198. Wish Anjali people were as principled, and not the usual Lajpat Nagar vendors looking for suckers.